At her first and likely only public debate with Virginia Rep. Dave Brat on Monday, Democrat Abigail Spanberger felt the need to remind the Republican congressman that he is running against her, and “certainly not” against House Minority Leader Nancy Pelosi. “Abigail Spanberger is my name,” the Democratic challenger in Virginia’s 7th District said to punctuate her closing statement. 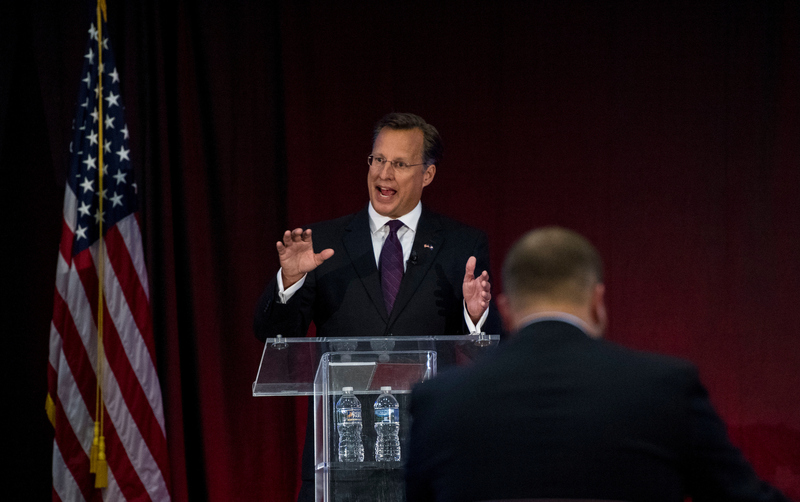 Brat mentioned Pelosi, a California Democrat, exactly 21 times in an hour-and-a-half long debate in front of a full audience at a local community college in Culpeper. A vote for Spanberger will be a vote for the “Nancy Pelosi liberal agenda,” he said, emphasizing the four-word phrase to try to hammer home a message that GOP outside groups have pelted the district with through TV and digital advertisements over the last several months. But Spanberger has said at least three times since July that she would “under no circumstances” vote for Pelosi to remain the House Democrats’ leader if she defeats Brat in November. She told USA Today that “time and time again” she has been forced to counter Brat’s claim to the contrary. Brat also knocked his opponent Monday for the millions of dollars in outside money being spent by liberal PACs to help Spanberger — even though outside groups have spent 33 percent more over the cycle on his behalf. “They are trying to buy this election,” the congressman said. Brat’s biggest outside benefactors are the hard-line conservative House Freedom Fund — he’s a member of the Freedom Caucus — and the Speaker Paul D. Ryan-linked Congressional Leadership Fund, which has tried to paint Spanberger, a former CIA counterterroism officer, as sympathetic toward radical Islamist elements. Two polls from the last month showed a close race. A Monmouth University survey gave Spanberger a 5-point lead. Brat led by 4 points in a New York Times Upshot/Siena College poll. Both results were within the surveys’ margins of error. Brat is best known for upsetting House Majority Leader Eric Cantor in a 2014 GOP primary. He won a second term two years ago by 15 points, while Trump carried the district by 7 points.